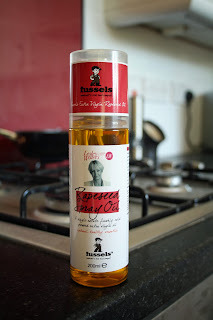 I'm offering five lucky reader the chance to win a bottle of brand new Cold Pressed Extra Virgin Rapeseed Oil from Fussels Fine Foods. Award-winning Somerset producer Fussels Fine Foods has teamed up with the Lesley Waters Cookery School to launch the first ever single estate Cold Pressed Extra Virgin Rapeseed Oil in a spray bottle – it’s a store cupboard essential and I have five bottles to give away. Rapeseed oil is low in saturated fat (Half the amount of saturated fats than olive oil), Rich in Omega 3, making it an excellent choice for anyone trying to reduce their cholesterol levels. It is also a great source of the powerful anti-oxidant Vitamin E. High levels of monounsaturates and Omegas 3, 6 and 9. Unlike many other oils, including olive oil, its health benefits are retained even at high temperatures (240oC smoke point) so it’s especially good for cooking, marinating, baking, frying and roasting…. To win: simply enter using the Rafflecopter form below: Please give it a few seconds to load as it can be a little slow at times. 5 winners will be drawn at random on Wednesday November 27th. This giveaway is open to the UK only - Good Luck. for using instead of normal oil! in stirfrys or on toast instead of butter! I would use it wherever I ordinarily use cooking oil as a healthy alternative. I would use it to bake an omlette! We would use it as a replacement for olive oil in cooking. I don't think I've ever tried it, so I'd use it for lots of things, see what it's good at. Searing meat or chicken for a stew maybe? for healthier frying as I need to shift some of this weight! Salad dressings, stirfrys and chips! I would spray quorn sausages and burgers before cooking them with it. I would use it for salad dressings or stir frys.